Like much of the U.S. the mid and late part of this past week was cold in my neck of the woods. I particularly feel for the birds. Now that I'm commuting to work instead of working from home I can't change out the water as much as other winters but I do it when I can. I guess I really need one of those heated bird baths but we usually don't have long winters like some places so I have put it off. Click here for Our World Tuesday and here for Nature Notes. Winter is very hard for the birds. I give them a sunflower, peanuts. Water freezes quickly. 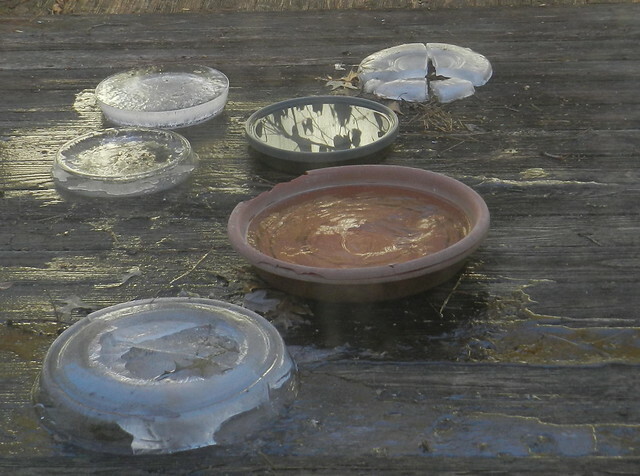 Looks like the birdbaths are excellent for making frozen pie molds. The birds are lucky to have people around like you who care and take off the ice caps when time allows. Ooh that poor little towhee -- he looks like he's going ice skating and I bet he isn't any more excited about that than I would be! Thanks for taking care of the birds and you be careful out there -- icy roads scare me (I'm a weather wimp, but you already knew that). The ice pictures are beautiful though! Haha. I thought it was someone on a frozen trampoline! Great shots of the birds! Oh poor birdies, their baths have turned into ice. I don't think the birds mind what you use... they just love what you have. Great shots of the lil bird. Oh, dear, poor birds, that does look cold. How lovely the birds are..you must be very patient to capture them ..! Keep warm! That poor bird is all puffed up and trying to keep warm. 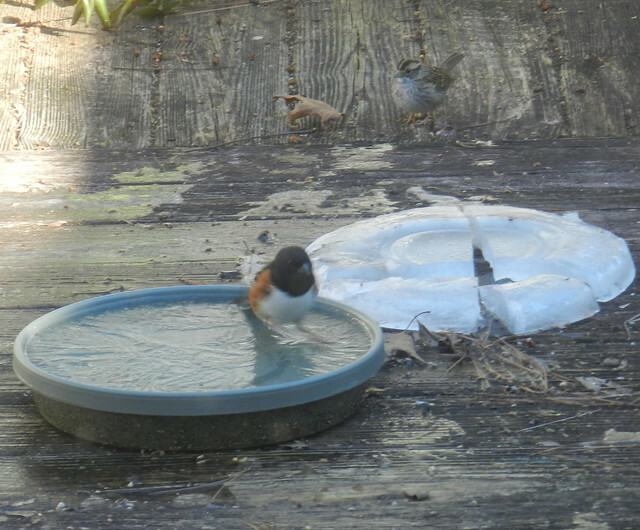 Cute Towhee and Sparrow..It must be cold there. Stay Warm and have a happy day! Oh, such poor little birds ! I am glad that you help them survive the winter ! It's minus 24 here, even the heated baths ice a bit. I don't envy those temperatures one little bit. Great shots ~ Tis wintry! ps. late in posting this week! The birds are appreciative, no doubt. 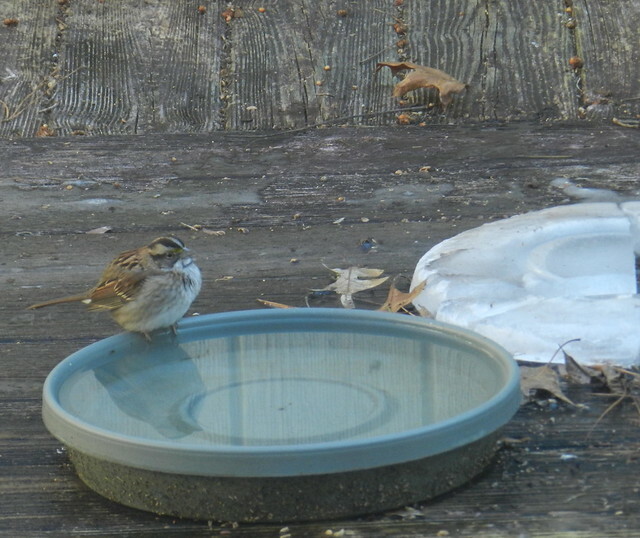 I love my heated bird bath. We simply turn it off on warmer days.